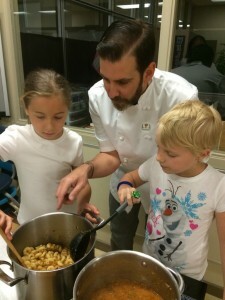 We are seeking volunteers for our Chefs in the Classroom – edible education program, proudly entering its third year. Our mission is to educate children in our community how to grow, cook and eat Okanagan fruits and vegetables, with a vision or growing healthy children in our community. We have a tremendous team of committed volunteers and hope that you will join or re-join us for this very rewarding experience. You do not have to be a Chef to participate. We have farmers, nutritionists, gardeners, home cooks, parents and others who contribute to the success of Chefs in the Classroom. Please read the following information before completing the online application form. Click here for the application form. Classes begin in April 2018. The dates are: April 9, 23, 30, May 7, 14, 28 and June 4. The classes take place on Monday mornings in the school classroom you are assigned to. The exception is June 4th which is the graduation and field trip to a farm. The classes and the graduation/field trip are each a 3-4 hour commitment. Each school has a team made up of 2 Chefs and 4 Support Members. There are approximately 23 students in the class. Our curriculum is geared to the Grade 3 level. There may be some combination classes of Grades 2/3/4. UPDATE: We host an orientation for volunteers on March 5th. We do request that all volunteers attend this orientation program. Click here for all details of what to bring on Monday for your training. Your team is counting on you to meet the commitment outlined above with exceptions for illness, vacation or unforeseen circumstances.